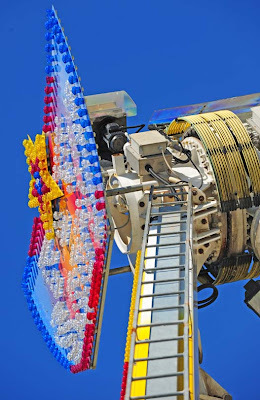 As August comes to an end, Fair Season begins. I stopped by Northampton's Tri Country Fair today, and shot some pictures . 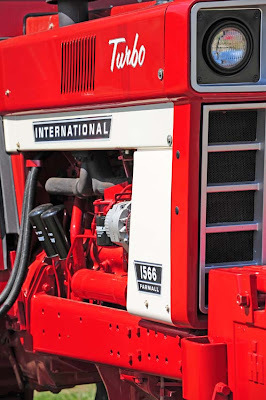 . .
Farmall was the agricultural tractor division of International Harvester. This particular rig has 150 horsepower, and dates from 1975. As you can see, the sign lays it out. Have a great day. No Refunds. No Exchanges. Five dollars. 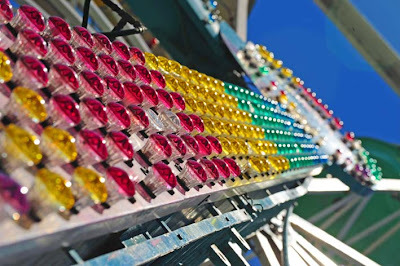 Hardened Polish farmers from Hatfield and Whately stand under the glare of unshielded neon fixtures and go nose to nose with the Florida carnies. It's amazing that they don't fight more often than they do, because the name here says it all . . . I can see Joe-Joe now, all 320 pounds of him. A pint of whiskey in his pocket and a shotgun on the counter. The first races started at 12:15 sharp, and I pushed and shoved my way through the crowd to get a seat by the rail at the second turn. As soon as I got seated, they were off! 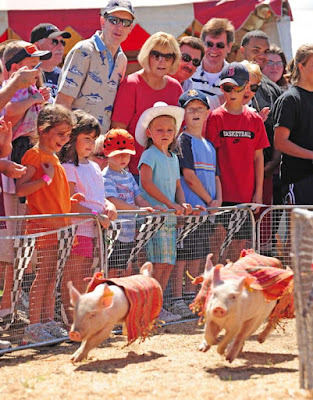 Pigmaster was favored three to one, and most of the money was on him, but in this shot you can see Pigster (a 20-1 underdog) moving smartly into the lead. The crowd is cheering, and the kids have a wary eye and their hands held high. Last year, a tyke lost a finger to a hungry porker on this very turn. I'll go back this evening. The fairs are always better at night, as the crowd gets drunk and wild. 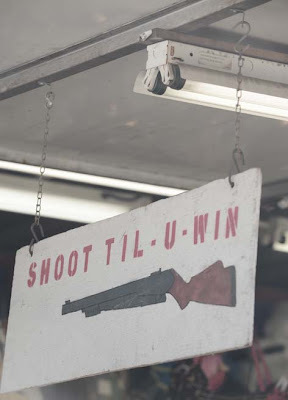 About five o'clock they take down that "shoot till you win" sign, because they know better. At 7, there's a demolition derby. 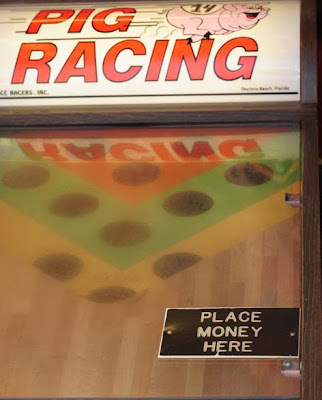 Place your money now. 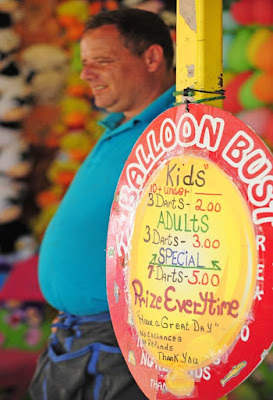 Carnies are a peculiar breed. It takes a special type to survive such a nomadic life sustained by hot dogs and funnel cakes. 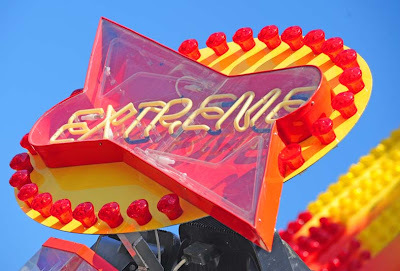 Love those images of the neon carnival ride signs. 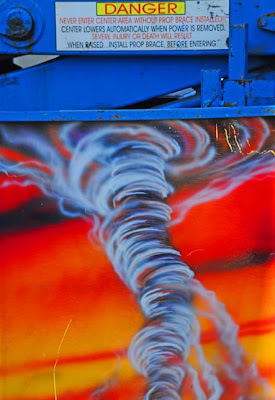 Did you ever take pictures of circus banners? Some of them, especially the vintage ones of things like the old side and freak shows are really gorgeous. I really, realy enjoy your photography. You have a good eye. I can't possibly comment on every picture I like, but just wanted to give you a blanket "Wow!" Its nice that you have so many talents. I love writing and photography myself, so I always enjoy stopping by your blog from time to time.